Göttingen, Germany and Waltham, MA, USA , September 04, 2018 / B3C newswire / -- Sartorius Stedim Biotech (SSB) (Euronext: DIM), a leading international supplier for the biopharmaceutical industry, and Repligen Corporation (NASDAQ:RGEN), a global life sciences company focused on bioprocessing technologies, have entered into a collaboration agreement to integrate Repligen’s XCell™ ATF cell retention control technology into SSB’s BIOSTAT® STR large-scale single-use bioreactors to create novel perfusion-enabled bioreactors. As a result of this collaboration, end users will stand to benefit from a single control system for 50 L to 2,000 L bioreactors used in perfusion cell culture applications. This single interface is designed to control cell growth, fluid management and cell retention in continuous and intensified bioprocessing and, ultimately, simplify the development and cGMP manufacture of biological drugs. Through the partnership, Sartorius Stedim Biotech and Repligen will further collaborate to equip SSB’s recently launched ambr® 250ht perfusion single-use mini bioreactor system with Repligen’s KrosFlo® hollow fiber filter technology. 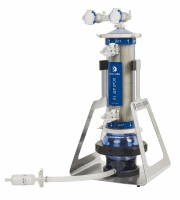 The bioreactor system will be sold by SSB as a complete single-use assembly. This optimal design conserves hollow fiber filter technology across scales, enabling customers to fast track development and scale up their cell culture perfusion processes. “Sartorius Stedim Biotech has continuously expanded its integrated upstream portfolio over the past years with a focus on robust and scalable, automated single-use solutions, optimized for high-cell-density applications. The collaboration with Repligen will result in easy-to-implement, high-performance and perfusion-ready bioreactors ranging from process development to commercial manufacturing scale,” commented Stefan Schlack, Head of Marketing at SSB. Repligen Corporation (NASDAQ:RGEN) is a global bioprocessing company that develops and commercializes highly innovative products that deliver cost and process efficiencies to biological drug manufacturers worldwide. The Company’s portfolio includes protein products (Protein A affinity ligands, cell culture growth factors), chromatography products (OPUS® pre-packed columns, chromatography resins, ELISA kits) and filtration products (including XCell™ ATF systems, TangenX™ Sius™ flat sheet TFF cassettes, and Spectrum KrosFlo™ hollow fiber TFF cartridges and systems). The XCell™ ATF Systems, available in stainless steel and single-use configurations, are used upstream to continuously eliminate waste from a bioreactor, to concentrate cells and increase product yield. Repligen’s corporate headquarters are in Waltham, MA (USA), with additional administrative and manufacturing operations in Shrewsbury, MA, Rancho Dominguez, CA, Lund, Sweden and Ravensburg, Germany. The following constitutes a “Safe Harbor” statement under the Private Securities Litigation Reform Act of 1995: This press release contains forward-looking statements, which are made pursuant to the safe harbor provisions of Section 27A of the Securities Act of 1933, as amended, and Section 21E of the Securities Exchange Act of 1934, as amended. Investors are cautioned that statements in this press release which are not strictly historical statements, including, without limitation, express or implied statements regarding Repligen’s partnership with Sartorius Stedim Biotech, the impact of a single control system on Repligen’s end users, and the future financial performance of Repligen constitute forward-looking statements identified by words like “believe,” “expect,” “may,” “will,” “should,” “seek,” “anticipate,” or “could” and similar expressions. Such forward-looking statements are subject to a number of risks and uncertainties that could cause actual results to differ materially from those anticipated, including, without limitation, risks associated with: our ability to successfully grow our bioprocessing business, including as a result of acquisition, commercialization or partnership opportunities; our ability to successfully integrate any acquisitions, our ability to develop and commercialize products and the market acceptance of our products; reduced demand for our products that adversely impacts our future revenues, cash flows, results of operations and financial condition; our ability to compete with larger, better financed bioprocessing, pharmaceutical and biotechnology companies; our compliance with all Food and Drug Administration and EMEA regulations; our volatile stock price; and other risks detailed in Repligen’s most recent Annual Report on Form 10-K on file with the Securities and Exchange Commission and the other reports that Repligen periodically files with the Securities and Exchange Commission. Actual results may differ materially from those Repligen contemplated by these forward-looking statements. These forward looking statements reflect management’s current views and Repligen does not undertake to update any of these forward-looking statements to reflect a change in its views or events or circumstances that occur after the date hereof except as required by law.